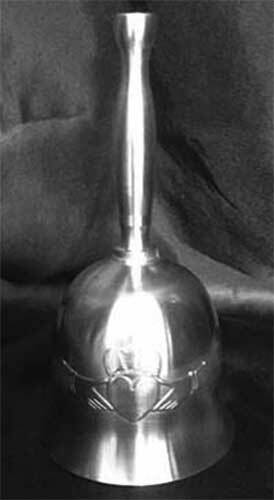 Claddagh wedding bell is cast in fine pewter and it is known as an Irish make up bell. This traditional Irish make up bell features the Claddagh prominently embossed on the waist. 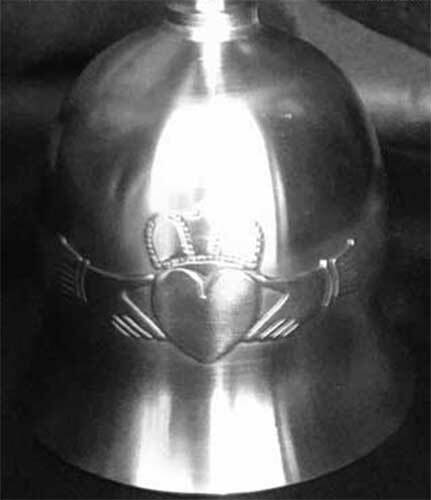 The Claddagh bell stands 6" tall and is made of lead free pewter. The Irish wedding bell is made in Ireland by Mullingar Pewter and is gift boxed with a Claddagh history card, along with an Irish make up bell legend card, complements of The Irish Gift House. Irish wedding bell is a brass design that proudly features the Claddagh.